Challenging architectural designs and complex construction buildings may call for standing seam roofs. Installing such complicated roof constructions places enormous demands on the roofing fasteners. Purpose designed fasteners that are user friendly, giving easy installation are key to installing these systems initially and for the duration of the building life. SDK fasteners, specially developed for halters, leave nothing to be desired in terms of ease-of-use and long term security. 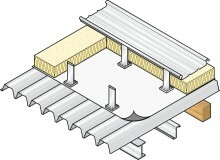 The SDK fastener with its square drive is held in a special drive bar. When the fastener reaches a pre-determined torque the peg snaps-off, ensuring the fastener is installed correctly. Extensive laboratory tests have proven that the connection to metal deck can withstand high dynamic loads without the risk of unwinding giving you extra security and peace of mind. With their propensity to over-driving and unwinding, conventional fasteners are inappropriate for fixing into metal decks. Using SDK fasteners, over driving and subsequent failure is simply not possible.